This Study Bible contains Darby English Bible (1890) translation. It also includes the King James Strongs Concordance. It has 936,097 references. It contains 3 different formats of the Bible. This makes for an extraordinary Study Bible in digital format. It is, with the resources included, like a treasure of Gold to those who seek God. It includes Darby English Bible formatted in a read and navigation friendly format, or the Navi-format for short. In addition it also includes the King James Strongs Bible where every word is linked to original one in The Strongs Concordance. The Hebrew in The Old Testament. The Greek in The New Testament. We have included the gematria calculations to the Hebrew words. For the Greek Strongs the gematria is also calculated. Niqquds in Hebrew is not supported in this ebook though. It also includes the Darby English Bible, tailored Text-To-Speech (tts) software technology. Most of the verses in the Bible formats are interlinked, so switching from one format to the other is usually only a click away. 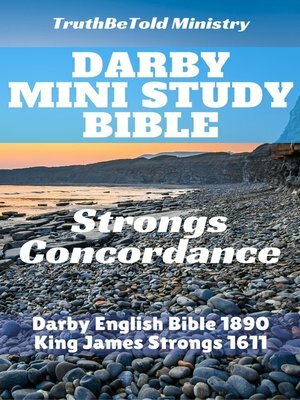 The combination of Darby English Bible, the concordance and its navigation makes this ebook unique. It literally is a goldmine to those who wants to dig into The Word of God. The navigation is solid and perfect for the quick lookup. Whether you are listening to a speech and need to keep up with the Bible references or just read the Bible, this is built for both. Please beware its size. It is big compared to "normal" ebooks, so your ebook reader may need some time to load and update its index before you are able to use it properly. How quick an ebook reader is able to load and update, varies depending on its hardware like the cpu, storage, memory and its operating system. Newer devices performs better, but once loaded we find it works as expected. Our own tablet from 2012 works beautiful, once fully loaded.